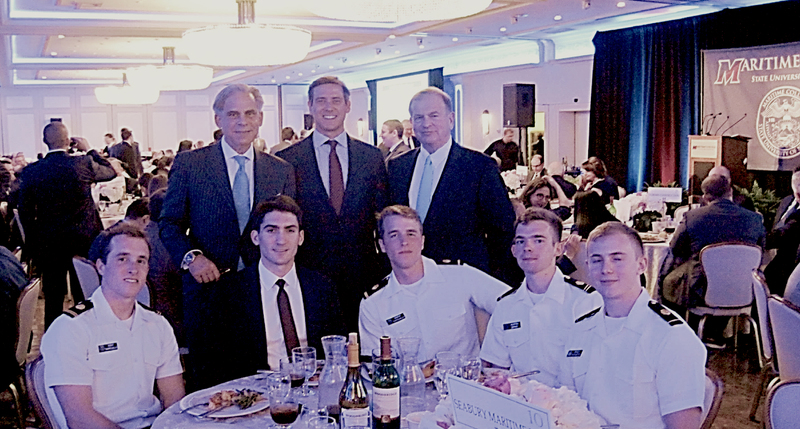 NEW YORK – May 23, 2018 – Seabury Maritime PFRA, the global maritime-centric advisory and investment banking subsidiary of New York-based Seabury Capital LLC (“Seabury Capital”), partook in the SUNY Maritime College’s 15th annual Admiral’s Scholarship Dinner as an Empire State VI Sponsor. Featuring U.S. Maritime Administration Administrator Rear Admiral Mark Buzby as a distinguished guest and attended by SUNY Maritime College alumni and friends, the dinner honored industry executives and raised funds to support the growth of the next generation of maritime leaders. In addition to being a sponsor and attendee at the dinner, Seabury Maritime PFRA has been an active member of the SUNY Maritime community, working closely with the college’s officials over the past year to embark upon a graduate Endowed Chair in Global Business and Transportation program. The program is designed to establish the premiere maritime business center, which will assist in the education of future maritime business professionals, creating a curriculum to train and graduate individuals who are highly skilled, ethically aware, and experts within the industry. “We are honored to be associated with the SUNY Maritime community, and to regularly interface with the student body to advance the many initiatives organized by the college We very much look forward to progressing the Endowed Chair with other key maritime industry stakeholders, and continuing to be a part of such an important maritime business educational program,” added Zimny. Standing L to R: Seabury Maritime PFRA President & CEO-Edward M.A. Zimny; Managing Director-Advisory, Patrick Bird; and Managing Director-Maritime Investment Banking, Henry W. Juan. Seated L to R: Are a few of the most recent cadets Seabury Maritime PFRA has sponsored with their various industry initiatives, including (in business dress), current Seabury Maritime PFRA Intern – Nick LaRocca.